Earth Resonant Frequency Natural waves are created which result from electrical activity in the atmosphere. They are thought to be caused by multiple lightning storms. Collectively, these waves are called 'The Schumann Resonance', with the strongest current registering at 7.8 Hz. These are quasi-standing [scalar], extremely low frequency (ELF) waves that naturally exist in the earth's electromagnetic cavity which is the space between ground and the Ionosphere. These 'earth brainwaves' are identical to the frequency spectrum of our human brainwaves. The Creator designed living beings to resonate to the natural Schumann Resonance frequency pulsation in order to evolve harmoniously. The Ionosphere is being manipulated by US government scientists using the Alaskan transmitter called HAARP, (High-Frequency Active Auroral Research Program) which sends focused radiated power to heat up sections of the Ionosphere, which bounces power down again. ELF waves produced from HAARP, when targeted on selected areas, can weather-engineer and create mood changes affecting millions of people. The intended wattage is 1,700billion watts of power. Geomagnetic Waves & GWEN Sixty four elements in the ground modulate, with variation, the geomagnetic waves naturally coming from the ground. The earth's natural 'brain rhythm' above is balanced with these. These are the same minerals found in red blood corpuscles. There is a relation between the blood and geomagnetic waves. An imbalance between Schumann and geomagnetic waves disrupts these biorhythms. These natural geomagnetic waves are being replaced by artificially created low frequency (LF) ground waves coming from GWEN Towers. Atmospheric Vapor Rivers Enormous, invisible rivers of water, consisting of vapors that flow, move towards the poles in the lower atmosphere. They rival the flow of the Amazon River and are 420 to 480 miles wide and up to 4,800 miles long. They are 1.9 miles above the earth and contain a volume of water equivalent to 340 lbs of water per second. There are 5 atmospheric rivers in each Hemisphere. A massive flood can be created by damming up one of these massive vapor rivers, causing huge amounts of rainfall to be dumped. The GWEN Towers positioned along the areas north of the Missouri and Mississippi Rivers were turned on for 40 days and 40 nights, probably mocking the Flood of Genesis. (This was in conjunction with HAARP, that creates a river of electricity flowing thousands of miles through the sky and down to the polar ice-cap, manipulating the jet-stream , like the Russian Woodpecker.) These rivers flooded, causing agricultural losses of $12-15 billion. HAARP produces earthquakes by focusing energy along fault lines. GWEN Towers are located on the fault lines and volcanic areas of the Pacific Northeast. Vaccine Implants Implants are now smaller than a hair's width and are injected with vaccine and flu shots. Millions have had this done unknowingly. These 'biochips' circulate in the bloodstream and lodge in the brain, enabling the victims to hear 'voices' via the implant. There are many kinds of implants now and 1 in 40 are victims from 'alien abduction' statistics, though 1 in 20 has also been gauged. The fake alien abduction event, revealed to be actually the work of US military personnel using technology to make hologram spaceships outside, virtual reality scenarios of going onto a spaceship with humans in costumes, has been astutely perceived. Though real alien abductions do occur, the 'alien abduction' scenario has been useful to stop any further investigation or accountability of government authorities by poor victims who would face mockery and appear silly. Electromagnetic Disease Transmission, ELF, & Chemtrails The physics and engineering behind electromagnetic disease transmission are frightening. Diseases can be reproduced as 'disease signatures' in that the vibration of a disease can be manufactured and sent on to be induced. (The brainwave pattern of hallucinogenic drugs can also be copied and sent by ELF waves to induce 'visions'.) Once diseases are sprayed in the air, electromagnetic-waves attuned to the disease, using harmonics and subharmonics, will make them more lethal and infectious by sending particular disease frequency death-patterns. However, some 'ETs' may be local boys. Voices in the head were produced in prisoners in Utah prisons using Tesla technology. Each of the prisoners received thesame message from an 'ET'. Today, it seems, it's easy to produce 'voices in the head' without implants. Tracking Cray computers, using artificial-intelligence, monitor the victims of government implants sending pre-recorded sound-bytes or occasional live messages. They are picked up by satellite and relayed to whatever large TV broadcasting antenna, GWEN tower or other microwave antenna is near the victim. It's believed that some type of body implants pick up the signal and broadcast the correct Tesla-wave pattern to create voices within the victim. The tracking implant keeps the staff and the satellite system informed every few minutes as to exactly where to send the voice signals. The master computer and central HQ for this is reported to be in Boulder, CO. It is thought that transponders are being made there as well. The central cellular computer is in the Boulder, CONational Bureau of Standards building. AT&T is also cooperating in this project. Several government agencies work together on this. 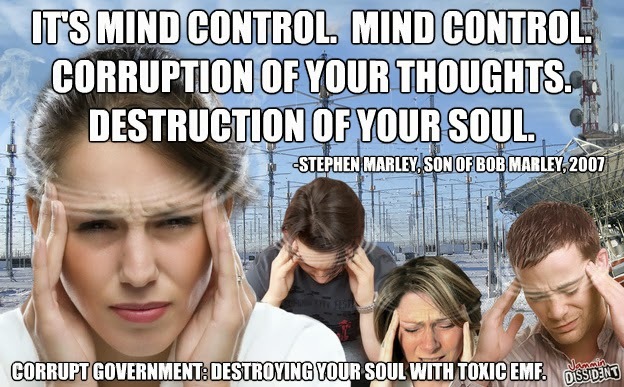 Thought Control Subliminal words in the correct electromagnetic-field that expresses human consciousness, attuned to the human brain, can enter our minds at a subconscious level. Our brain activity patterns can apparently be measured and stored on computer by super-computers. If a victim needs subliminal-thoughts implanted, all that is necessary is to capture, save on computer, and target the person's brainwave pattern to send them such low frequency subliminal-messages that they actually think it is their own thoughts [confirmed by Al Bielek and Preston Nichols with the Montauk Project in Long Island]. The researcher Majix says our brains are so sensitive that they are like liquid-crystal in response to the magnetic component of the earth. Tim Rifat wrote in his Microwave Mind Control in the UK articlehttp://www.brazilboycott.org/ that cellular phones use 435 MHz. UK police use 450 MHz exclusively. Dr. Ross Adey used this for CIA behavioral modification experiments. Police have a vast array of antennae to broadcast this frequency all over the UK. Adey used 0.75mW/cm2 intensity of pulse modulate microwave at a frequency of 450 MHz, with an ELF modulation to control all aspects of human behavior. 450 MHZ radar modulated at 60 Hz greatly reduced T-lymphocyte activity to kill cultured cancer cells. A study of USA 60 Hz power lines repeated this finding.